Hybrid ejector-liquid ring systems were first designed by Croll-Reynolds vacuum engineers in the 1960s in response to a sharp increase in energy costs during that decade. Croll Reynolds hybrid systems offer the same suction capacities and suction pressures as ejectors at reduced energy costs. The industries and applications where Hybrids are used mirror the applications and industries where ejector systems are employed.Like ejectors hybrid systems are custom designed and can be fabricated from a wide variety materials and packaged with full instrumentation and controls. Croll-Reynolds Hybrid systems incorporate single ad two stage liquid ring vacuum pumps with ejectors and condensing heat exchangers . These systems operate at the same capacities and suction pressures as a conventional ejector systems and can be supplied in packaged systems incorporating piping, instrumentation and controls. Hybrid ejector-liquid ring systems can be operated using low pressure steam and installed at ground level. The process gasses and vapors are drawn in through the suction inlet of the ejector and compressed to an interstage condensing heat exchanger. 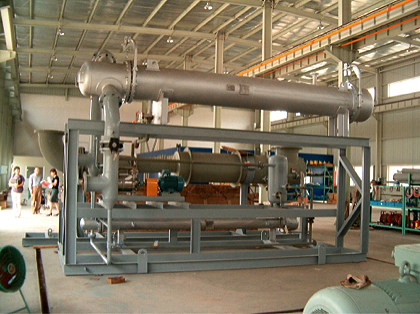 The heat exchanger removes the condensables and discharges to the liquid ring pump. The liquid ring pumps serves as the final stage of the vacuum system and also receives the condensate from the interstage condenser.